Following up the first day of Final Fantasy XIV‘s final leg of Fan Festival activities in Frankfurt, producer/director Naoki Yoshida had a chance to sit down for a special Stormblood-themed round-table conference. 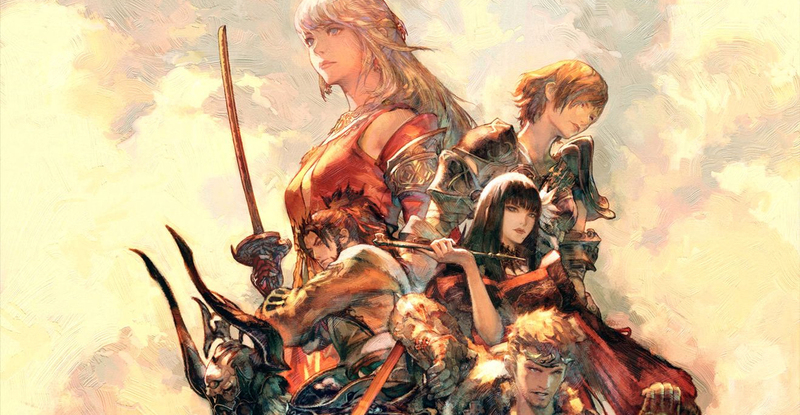 Nova Crystallis along with select press from around the world were in attendance for a chat discussing different aspects of the upcoming expansion – including locations and the newly revealed Samurai job class. Yoshida: Thank you for staying so late for this. Last October we began our group of Fan Festivals in Las Vegas, and then Tokyo and now our final one here in Frankfurt. With each Fan Fest, we use it to reveal new information about Stormblood. While there are still new things to reveal, we feel like we’ve given you a good idea of what Stormblood will entail. I know you have a lot of questions, and there may be some things I can’t answer but I’ll try to answer as many as I can in the time we have. I’ve been standing all day in these so I’m going to sit down. —After this third event, what experience have you gotten from meeting fans from different places? Yoshida: Having these festivals is for the fans, but it’s for the development team too. It motivates us to see the fans; we use that energy to support us in our future endeavors. —Lots of the new expansion areas have connections to Japanese culture. How important is it for you to have areas that reflect your own culture? Is there extra pressure while developing these areas? Yoshida: When creating these areas like Hingashi and Doma we had it in the back of our minds to create something like Japan. Japan has a very long history but depending on who you ask you’ll get a different version of what that history is. Edo period, post-Edo, pre-Edo etc. 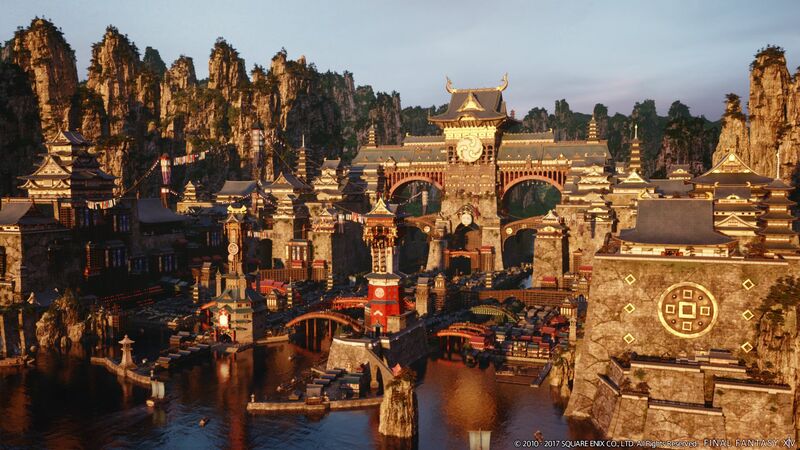 However when visually designing Kugane and Hingashi, instead of using one idea, we wanted to meld the different ideas of the Far East to make things unique. We discussed it a lot to make something that’s truly unique. To make one thing clear though, when we talk about Doma and Hingashi, they’re two very different countries with Hingashi on the island and Doma on the continent to the east. —This time there will only be two jobs. Is there any chance for a new job for the 4.x patches? Yoshida: Currently there are no plans for a third job. Of course, there are a lot of people – myself included – who are looking forward to new jobs. Creating an unbalanced job or ruining existing balance is something we don’t want to do. We’ll revamp the system in 4.0, balance it, then maybe we’ll make another job. —Will there be more cross-server functionality in the future like Linkshells and the friends list? Yoshida: In fact, the development team is currently working on cross-world friends lists. Hoping for 4.0 but it might not make it. For the rest, there’s no time table but we are doing it. —Is your Samurai costume comfortable? Do you plan to wear it to work to inspire you team? Yoshida: Yes, its very comfortable. In fact, I was only supposed to wear this for the keynote, but because its so comfortable I’ve worn it the whole day. I want to take this home to Japan, but the German team put lots of work into this and so… my staff told me I have to leave it here. If I happen to take it back and wear it at the office, I don’t think my staff would be inspired… they would probably be angry that I was goofing off. —We saw the implementation of Grand Company platoons. Will those NPCs be available in other content? Yoshida: The plan for this is already finished and we’re working on the AI for the platoon. As most staff is working on 4.0 content though, it’s on the back burner. Once 4.0 is out we’ll have it done soon after release. —What are priorities for future Fan Festivals? What are key lessons you’d use from here for a future festival? —After this extended trailer it seems like a lot of fans forgot about Ala Mhigo. Are you scared Doma will lower the hype for Ala Mhigo? Yoshida: What we don’t want players to forget is we’ve shown a lot of interesting areas in Ala Mhigo. In addition to the ones in Othard we have plans for Ala Mhigo. Fifty percent of 4.0 will occur in Ala Mhigo. —Since we’re leaving the PS3 and you can expand upwards with the specs, will you be patching for PS4 Pro support? And will there be support for Nintendo Switch? Yoshida: Rather than using the PS4 Pro’s power to adapt to say 4k display, we’re thinking of using it for game performance. We’ve begun work on a Pro patch and hope to have details soon. I’ve mentioned this before with Xbox One inquiries – I want the game on as many platforms as possible. The one condition we have is that we can keep the cross-world matching going. If we can clear that, then a version on the Switch is something we’d consider. —With the addition of swimming, do you see Blitzball in the future of FFXIV? Yoshida: To be honest, yes we have plans… maybe. The thing is, we’ve run into a few problems. There’s the opinion that if we released it as it was in Final Fantasy X, players might lose interest in it quickly. Then on the team we had the idea of – because we’re an MMO, lets make something that fits with the style of game we have. However if we do that, then we’re going away from the Blitzball people know and expect. We’re trying to find a good mix of both sides. Because we have swimming and diving its natural to get that in the game. —There’s been talk about introducing a quick leveling potion (jumping potion) and I’d like more details about that. Yoshida: This is something we’re still debating in the team. We can’t say anything now but we hope to have an announcement soon during a Live Letter. —Can you tell us more about what’s planned for the battle system revamp? Yoshida: We’re not going to be rebuilding it from the ground up. We’re concentrating on two things with this revamp. During 3.x, the action rotation for high DPS became very complex. We saw a large gap form regarding DPS from skilled and technical players and more casual players and so we wanted to bring up the bottom. The second thing is that with FFXIV lots of players use the controller. With the increase in actions, it’s hard for them to use all of the actions available. There aren’t enough ways to use these actions so we’re cutting the number of unused actions and combining similar actions to make the level 70 action number about the same as it is now. Currently with a lot of the jobs, it’s clear that jobs have to monitor a lot of buff icons. We want to create job specific UIs to alleviate that and make monitoring those things easier. We’re going to balance, adjust, tweak and refine this UI right up to the release, so we probably can’t show you anything until May. —We’ve seen Doma is in one of the new areas, but we haven’t seen Ala Mhigo. Will players be able to go there? Will it be a field area? An instance? Yoshdia: Hmm I wonder… to get that answer you’re going to have to first liberate Ala Mhigo because it’s under the control of the Empire. We have something unique in store for you that takes advantage of the MMO genre. We put a heavy focus on the story and think we have something very exiting in store for the liberation of Ala Mhigo. —What is the added value to you and the game to have a subscription-based game? Yoshida: I’ve answered this a lot in the past and it’s a long answer. Please contact our PR team and they’ll hook you up with the answer. 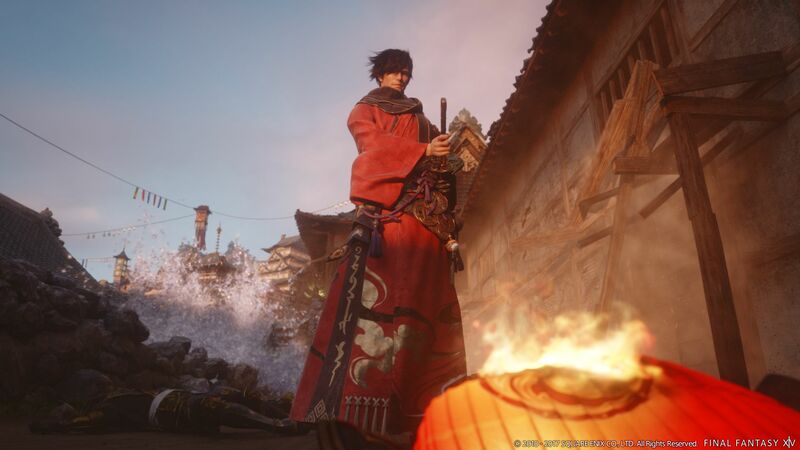 Yoshida: It’s a complex answer… it wasn’t like we decided “We want a DPS job; let’s make it Samurai!” It was more of what I envisioned a Samurai character to be. I see a more post-Edo Samurai and that felt like it had to be a DPS type. Basically, the main concept our team has when making Samurai now is a Kurosawa’s Seven Samurai-type of Samurai. —What makes FFXIV stand out from other MMOs? Yoshida: The biggest thing is the speed at which we release major updates, expansions and have Fan Festivals. —Can we see inconsequential monster encounters have battle time reduced? Yoshida: We do believe with 3.x that some regular field battles were a little longer than usual so with 4.0 they’ll be shorter. —We have people coming from all over the world to Fan Festivals like Free Companies or people that met in game. Do you plan to introduce an app that would let players to stay in touch with their friends and groups? Also, what are your plans with PlayStation VR? Yoshida: We’re currently in development of a new application to help players contact their FC players and friends outside of the game. We wanted it ready for 4.0 – it might not make it, but it will be released soon after. We’ve tested the VR, but you need 60 FPS if not more to avoid motion sickness. If you wanted to create something that really took advantage of that, you would need content made especially for VR but if you do that you limit it to only those few with VR so we want to spend the time making content for everyone. We have had some ideas talking to the media about a special room like “Miqo’te Paradise” where you pay $50 and go in and have some fun with Miqo’te. We’ve brought this up with the designers on our team… so far no one has raised their hand saying they want to make it yet. Thanks to Gamer Escape for transcribing assistance. Posted in FFXIV Fan Festival 2016-7, Final Fantasy XIV, Headlines, Interviews, Special. Thanks for this interview guys! Commenting before I read it, just had to say thanks. I hope they do cross-server friends eventually like they stated in this, along with cross-server type of linkshell to keep in contact with them. So many of my net friends are either on Balmung or Faerie, would be nice to actually have a way to talk to them in-game and easily invite them than rely on the cross-server pf locked party system. And yes before anyone says it, I know voice chat systems and skype exist, but I’m too lazy to keep hopping screens to have dual conversations. What can I say? I fail at multitasking. That’s one of my hopes, too. Stupid idea anyway. It’s the Au’Ra I want! I’m hoping for this too. It’s easier to meet people cross-server now due to the cross-server party finder so having a way to stay in contact after would be great. It’s on their list, so I guess it’s a “please look forward to it” for now! she is if you want her to be.